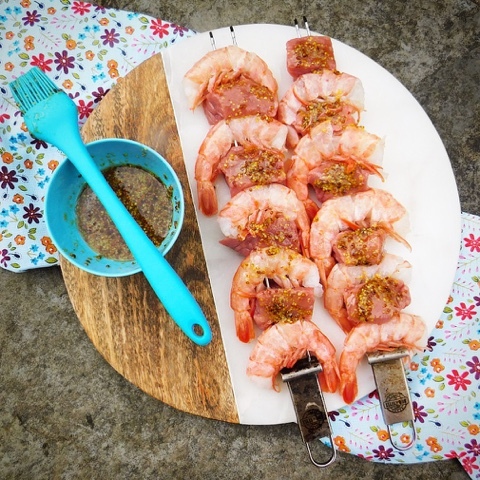 Succulent and tender Shrimp & Steak Kebabs glazed with Maple Syrup and Wholegrain Mustard will raise your grilling game. BBQ made easy with the help of frozen food plus my top five tips for successful barbecuing. They will taint the flavour of the food with a nasty chemical taste. Instead get yourself a Chimney Starter and don’t ruin a BBQ with lighter fluid flavored steaks. Charred doesn't mean cooked and just because something looks done on the outside doesn't mean it is on the inside. A thermometer gives you peace of mind and ensures you can cook steaks exactly to personal preference whether that be rare, medium or well done. Try not to peek and don't keep lifting the lid - keep it closed while you grill. With the lid on heat works on the food from above as well as below. Take the lid off and all the hot air escapes and the food cooks from below only. You want your BBQ to be memorable for all the right reasons. Use different utensils, plates and chopping boards for raw and cooked food. Keep cold foods below 5°C and hot foods above 63°C and don’t leave food that you would store refrigerated standing around in the warm before serving. Accompaniments served with BBQ are often second rate at best. Don't let this be the case. Get inventive with your vegetables, salads and sauces. Upgrade humble burger buns to brioche and flatbreads. Put as much effort into the sides as you do with the chargrilled protein. For today's recipe I've used a couple of premium products from Iceland's freezers. 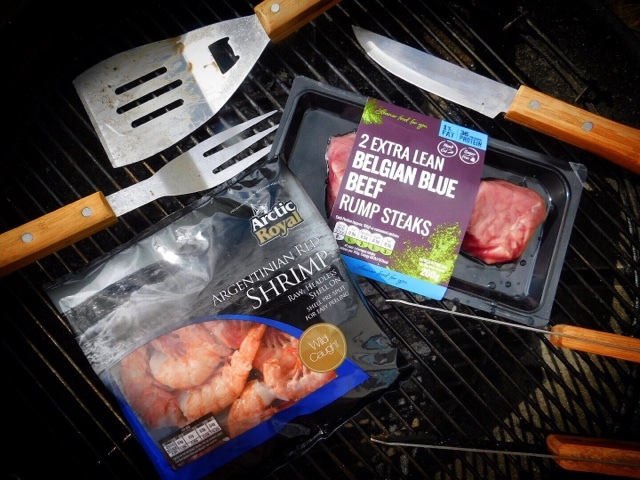 I'd previously tried the Extra Lean Belgian Blue Beef Steaks as there was a pack in my bag for the May Mystery Challenge however the Argentinian Red Shrimp were a new product for me. These wild caught Red Shrimp are responsibly sourced in the Southwest Atlantic Ocean. They are raw, headless & shell on. The flavour is amazingly sweet and succulent and the shells are pre-split for easy peeling - this is such a good idea and takes away all the hassle associated with eating prawns with no need for asbestos fingers! Whilst the quality of these ingredients mean they'd be perfect cooked 'au natural' I chose to combine them with a piquant glaze made with sweet maple syrup and tangy wholegrain mustard. This works a treat with pretty much anything on the grill so don't be afraid to also give it a try with chicken, sausages or salmon. To accompany I used one of my favourite Iceland products. Cous Cous with Vegetables. This takes only 7 minutes in the microwave to cook. I served it cold with some fresh herbs stirred through. The sun is out, the BBQ is lit and the heavens open. Fear not you can still make the recipe below indoors under the grill or on a griddle pan. Either way - rain or shine - I'd advise optimism and stocking up your freezer! Fingers crossed for a BBQ summer. Shrimp - Defrost at room temperature for approximately 2-4 hours or overnight in refrigerator. Steak - Defrost in a fridge for 24 hours. Allow the steak to rest for 10 minutes at room temperature before cooking. Cut the steak into bite sized chunks and thread onto skewers alternating with the red shrimp. Mix together the maple syrup and mustard in a small bowl and season with salt and pepper. Brush the glaze onto the steak and shrimp skewers. Cook on a hot barbecue for 3 minutes on each side or until the steak is to your liking and the shrimp are cooked through. 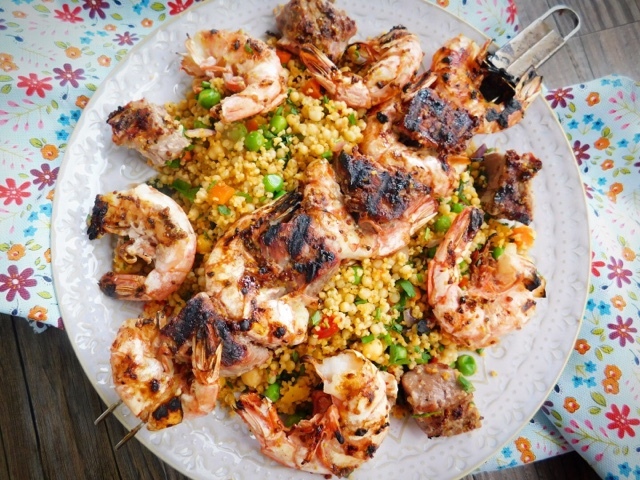 For further #PowerOfFrozen alfresco BBQ inspiration check out the following recipes from my fellow bloggers and go forth and stock up your freezer so you are ready at the drop of a hat when the sun does put in an appearance. Surf and turf is definitely my kind of mojo, love the glaze you have on these. The glaze really does raise them to a whole new level and works really well on anything grilled - even veggies. I am always looking for new grilling recipes to try and this looks so good! Shrimp and Steak is always wonderful together and pairing it with a sweet and tangy glaze sounds amazing! Great tips too! Definitely a match made in heaven, or Iceland in this case! It works really well on one pan traybakes too - meat, fish and veggies. OMG these look incredible Claire!, such a great combo and they've made me HUNGRY!!! Thanks Jane, the flavours do all combine really well together. I think the current weather is proof that planning for a barbeque in The UK can be tricky. 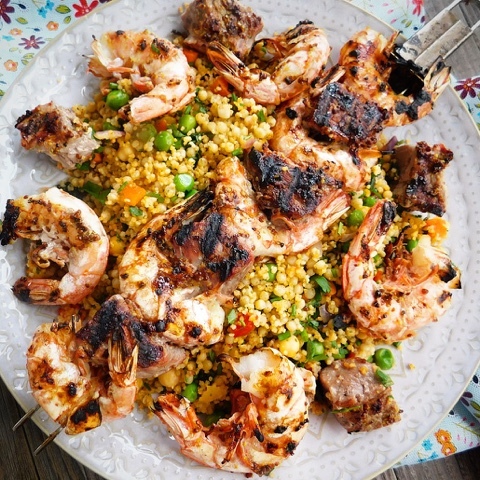 Having some food handy in the freezer is of course a great idea, just means that you don't miss out on the freshness of things like shrimp if the weather is a definite no. I do like the idea of shrimp and steak together, and the glaze just adds to that deliciousness. We've had everything from glorious sunshine to torrential rain and thunder and lightening this week which just proves you have to strike when the weather is hot so to speak! That glaze sounds soooo good. And great tip about a chimney starter! The chimney starter is revolutionary - makes charcoal almost as quick as turning on the gas. Yummy, love surf and turf, your skewers are marvelously tempting! They are little morsels of chargrilled awesomeness! So wish we had an Iceland nearby, they closed our branch a couple of decades ago, such a shame as these frozen seafood and meat products look really good. And loving the flavours you've added. Oh no that's a shame as there really have upped their game big time of late. 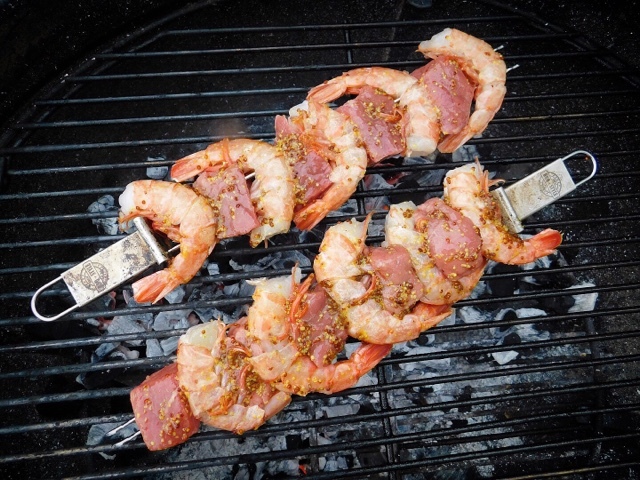 Steak and shrimp just go so well together, so I love the idea of putting them on a skewer. One to try at our next BBQ. This looks great. Frozen ingredients are perfect for an impromptu barbecue. Absolutely - a well stocked freezer really can save the day on so many occasions. This is a lovely recipe. The glaze sounds great and it's so handy to use frozen food. I'm going to try it this weekend - the weather is supposed to be really nice here. I'm scared to look at the weather forecast but keeping my fingers crossed for a BBQ worthy weekend. Yum! I don't grill nearly enough, but this definitely makes me want to. 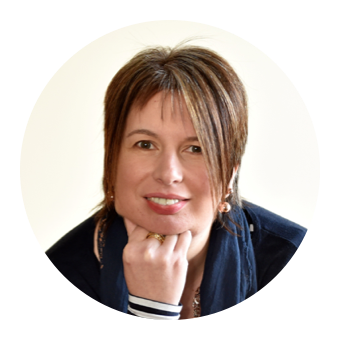 I love the ease of using frozen ingredients and all of your tips are great. I laughed a bit at if you're looking it ain't cooking. You may have laughed but you'll remember 'if you're looking it ain't cooking' forever now! Thanks for all the grilling tips! I should really start grilling more often! You are welcome. Grilling should be fun not stressful. The glaze really takes anything that you BBQ to a whole new level. I've never really cooked shrimp on the BBQ as it's so fiddly to eat them when they are burning hot but the split shell on these makes it so easy. Lookin' good. Surf 'n turf on a stick - who could possibly say no to that?!? Now I'm wishing that I'd called this recipe Surf and Turf on a stick! I'm so excited to try this glaze, as I never add maple syrup to savoury food but it sounds like a wonderful idea! And I always buy these shrimps from Iceland, excellent quality. So you've never had bacon and maple syrup? Seriously you have not lived! Do give it a try. What a fabulous recipe! I absolutely love surf'n'turf and your recipe with its tasty glaze sounds delicious. I will have to buy those scrummy looking shrimp, perfect size for BBQ! Seriously these shrimp are to die for! So plump and juicy and easy to peel and eat.